We planted the new blueberry bushes on Sunday. We bought 3 each of 4 different varieties that seemed appropriate for our climate. I collected enough rocks to create a border around the new patch. At the moment there is residual grass but we are planning to mulch the entire area. We will order a load of pine mulch which is acidic and suitable for the blueberries. Underneath the mulch we will place several layers of newspaper to suppress the grass. 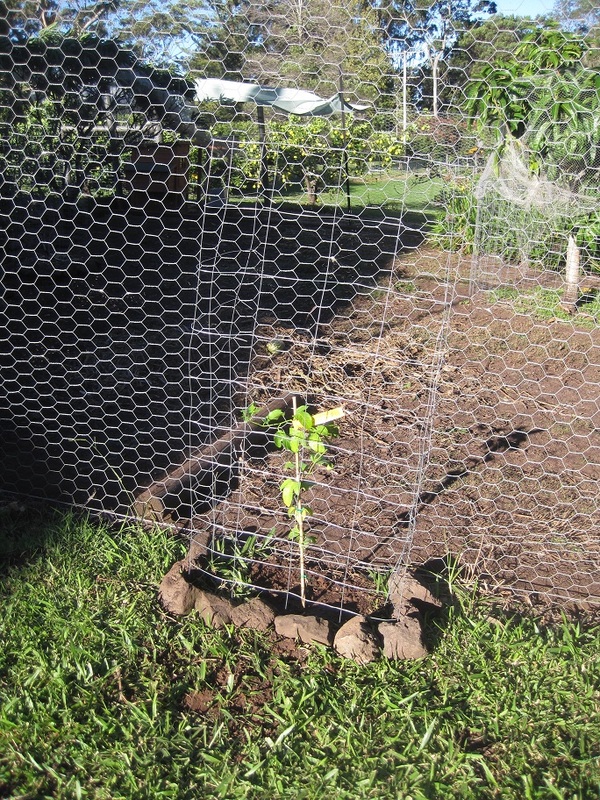 The passionfruit vince which we bought at the same time as the blueberries has been planted next to the chicken run so that it can grow on the fence.. Finally, I wanted to show you one of the ornamental plants in our garden. It is a gorgeous apricot hibiscus which was here when we came. The shrub is nothing to look at but the flowers are stunning. 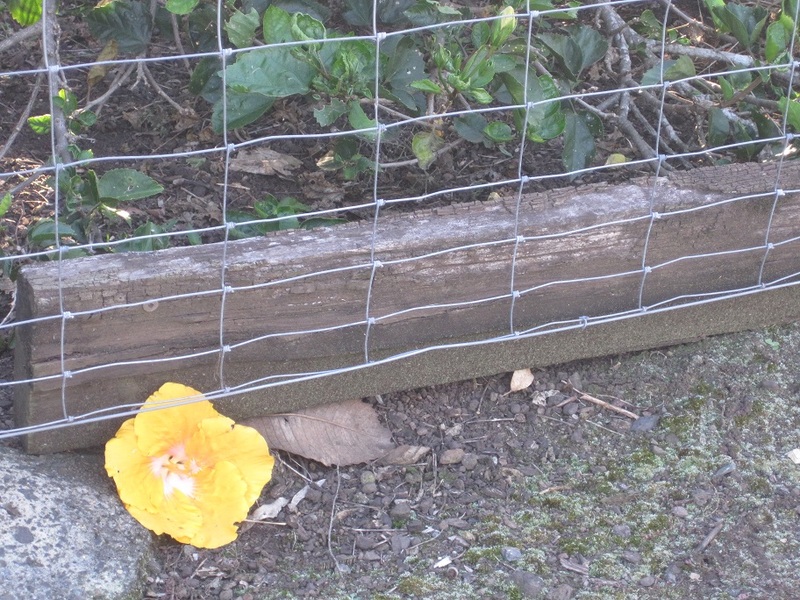 Here is one that managed to escape under the old sleeper which is placed to stop the chickens escaping under the fence. There are lots more buds on the plant and soon it will be covered with beauties like this. 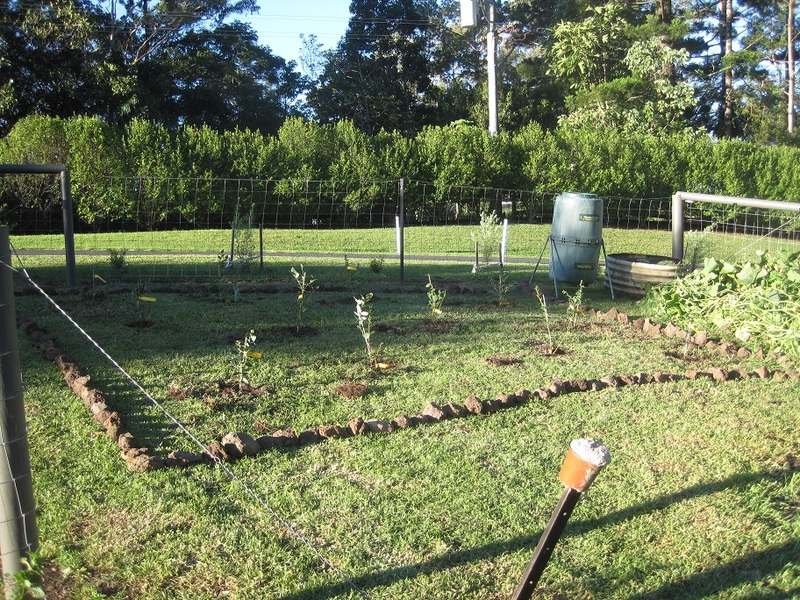 We are considering planting the garden bed infront of the verandah with a selection of hibiscus shrubs. There is a display at Woombye (Sunshine Coast) on Saturday so we are hoping to go and get a few ideas. It is Wednesday already and it is nearly a week since my last post. I have been busy doing things instead of writing and unfortunately have not always had the camera handy. However, here are a few photos of some of the things we did on the weekend. 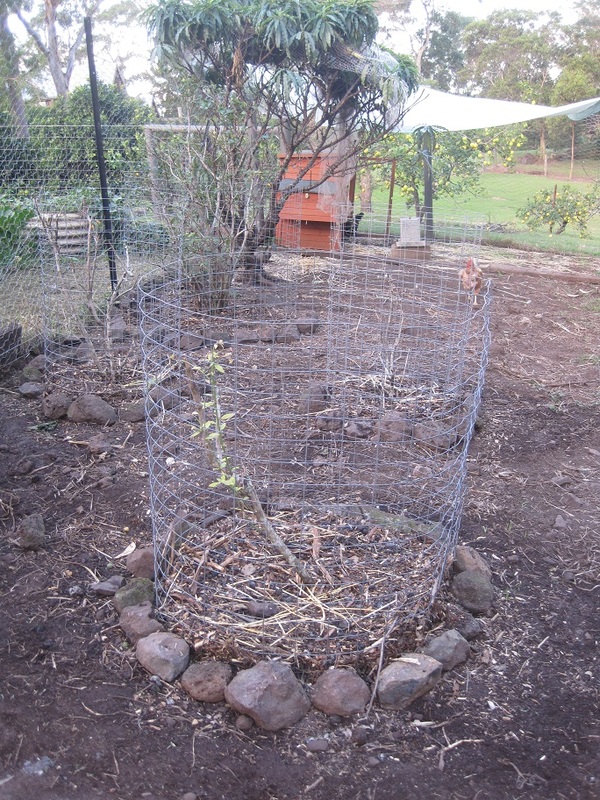 The existing blueberry bushes have been pruned, enclosed with wire surrounds and mulched thoroughly. These bushes have been in for several years but are now in the wrong place as they are located within the new chicken run. I previously had the entire area enclosed to prevent the chickens from digging around them and exposing the roots but I decided that individual enclosures were a better idea. The fencing around the perimeter of the vegetable gardens is almost complete. I the meantime I have temporarily closed off the last bit to exclude the chickens. This meant that I was able to prepare a new garden bed and be safe in the knowledge that it would not be dug up immediately by the marauding feathered army. The rock edging is made from some of the hundreds of rocks that litter our property. The bed is inside the fence nearest to the house so I plan to make this into a herb garden. 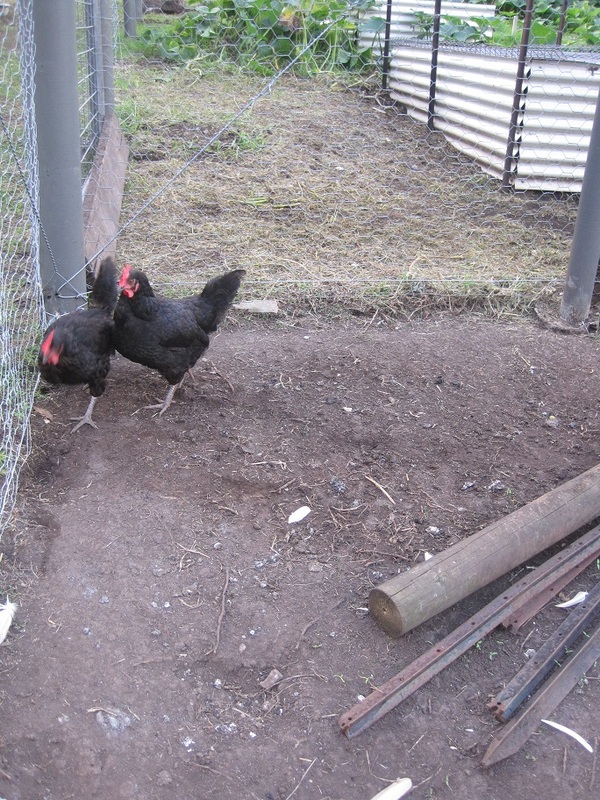 Finally, I clipped the wings of the chickens in order to make sure that they could not fly over the 1200mm fence into the vegie garden. I had wanted to do this for ages but never felt quite brave enough. With some advice from an online forum, a Youtube video and The Duke to hold the chicken I was able to clip the flight feathers on one wing of each chicken. The exercise seems to have been successful as there has been no more instances of flying over fences. Today is the first day of the month. The weather has been a bit cooler the past week and my mind starts to turn to gardening as our prime gardening season beckons in the next month or so. Despite the fact that it is supposedly too hot to grow much over the summer there always seems to be something to harvest in the garden and today was no exception. This is the reward today for what has been a summer of neglect in many ways. Avocadoes, purple beans, corn, figs, blueberries, cherry tomatoes, lemon and eggs. 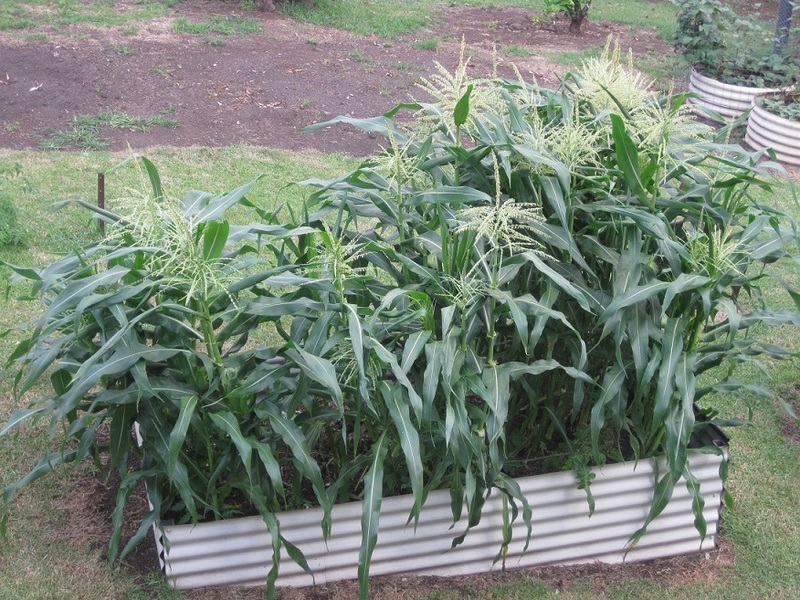 This is the first of the corn. It is not bad considering that the seeds were expired by about 3 years, they got no supplementary watering, were almost dug up by the chickens, flattened by the wind about 3 weeks ago and generally neglected. 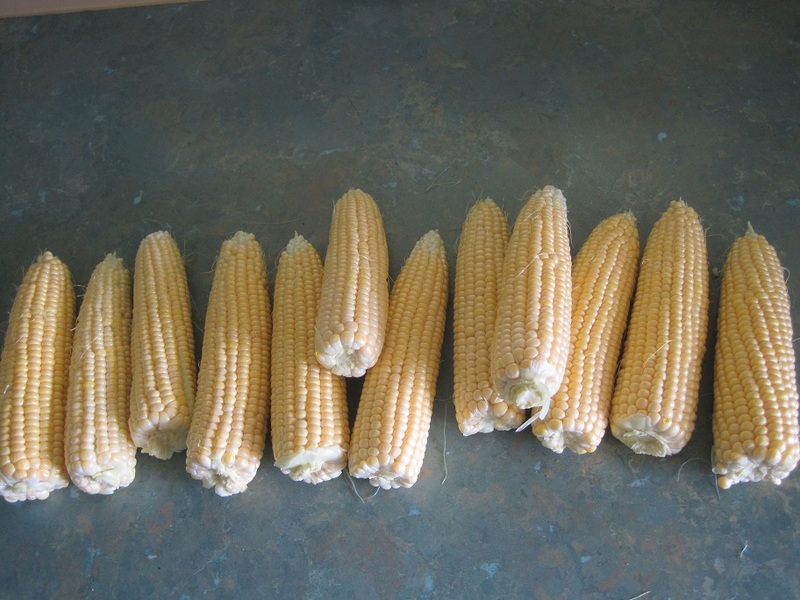 The Duke cooked 2 cobs for his lunch and declared that it was the best corn we have ever grown. Tonight I am going to blanch the rest, strip the kernels and freeze them for use during the year. 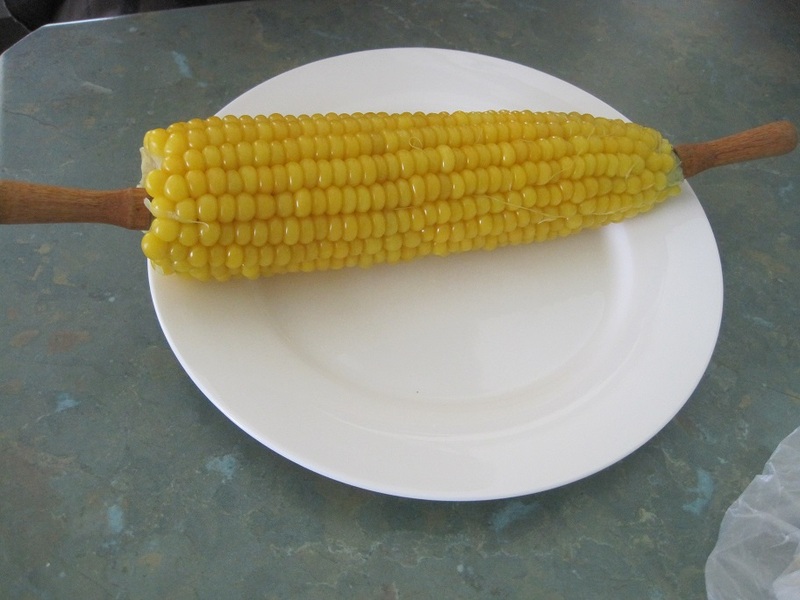 I do not particularly like corn on the cob but we do add it to dishes such as tuna mornay and it will be great to use our own organically grown corn instead of imported, canned corn kernels. I will also be drying more of the figs. I did some last week as well. I have never blanched and frozen corn before so I will make sure I take some photos and will tell you all about that in another post. It would be heartbreaking – not to mention an economic nightmare – being a farmer. 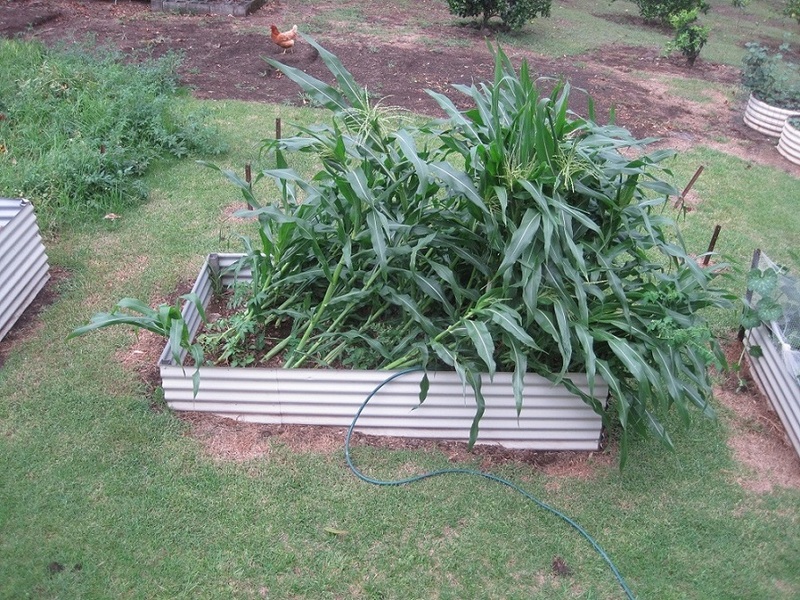 It was bad enough when my lovely little crop of corn was just about flattened almost a week ago. We had a 40C + day with hot wind followed the next day by wild thunderstorms, gale force winds and rain. 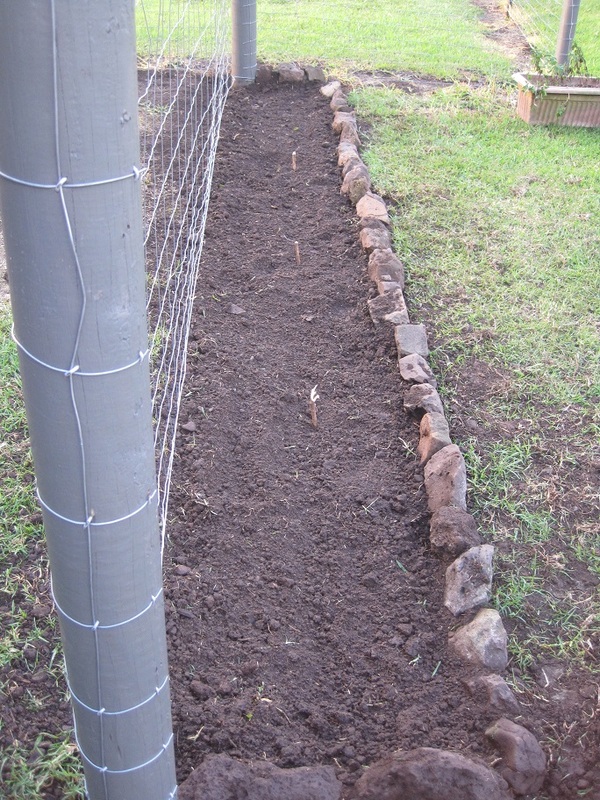 The following afternoon I managed to add some extra soil/mulch to the bed and propped them back as upright as I could. I was not overly optimistic but it appears to have been reasonably successful. Here is the same bed 5 days later. Meanwhile, we continue to manage to harvest something from the garden almost every day. This is quite an achievement since we devote almost no time to it and a lot is actually self-sown. 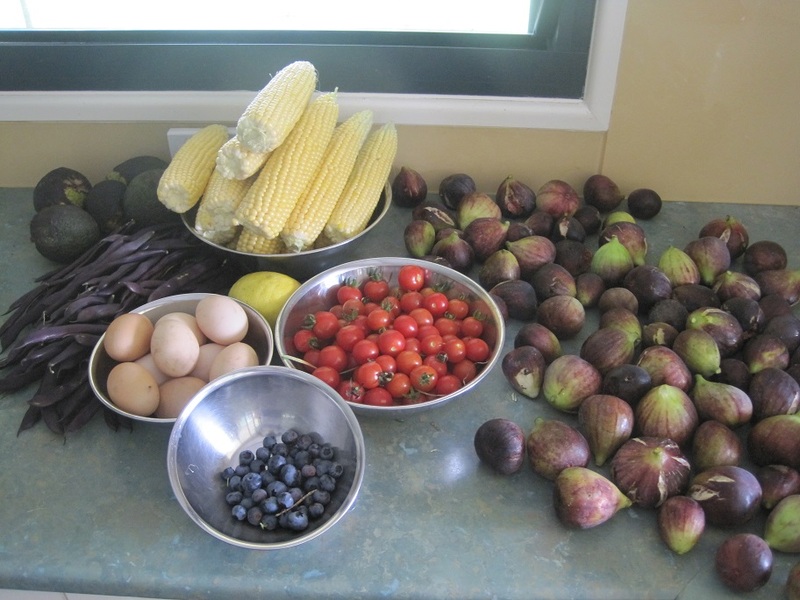 Today’s bounty included blueberries, cherry tomatoes, pumpkin, figs, avocadoes and eggs from the chickens. Are you picking produce at the moment? Perhaps you are snowed in and planning the spring planting?